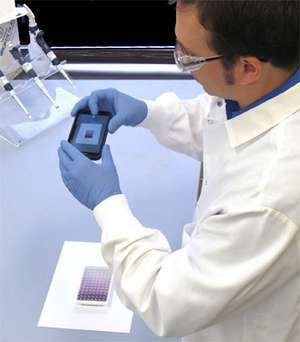 Now you can read your ELISA plate with an iOS or Android tablet or cell phone. The Enzo ELISA Plate Reader app is provided by Enzo Life Sciences as a tool to enable the use of colorimetric plate based assays in a wider variety of environmental settings. The plate reader application can provide quantitative results while providing portability and functionality when a lab based plate reader is inconvenient or unavailable. Initial tests show a 90% correlation with the analysis made by a spectrophotometer. The app is no longer available.